Sophie Brunner Joins Heat UA Coaching Staff for Summer! Rockford Heat is excited to announce a huge addition to our Under Armour Coaching Staff this year! Sophie is not only a great player, she is also a great role model for anyone including the next generation of collegiate athletes! 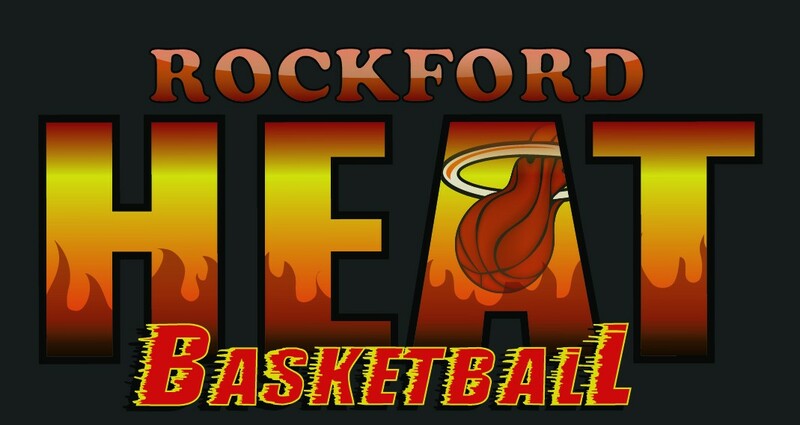 @dopie21 we are excited to have you help the athletes from around the Stateline in the Rockford Heat program! 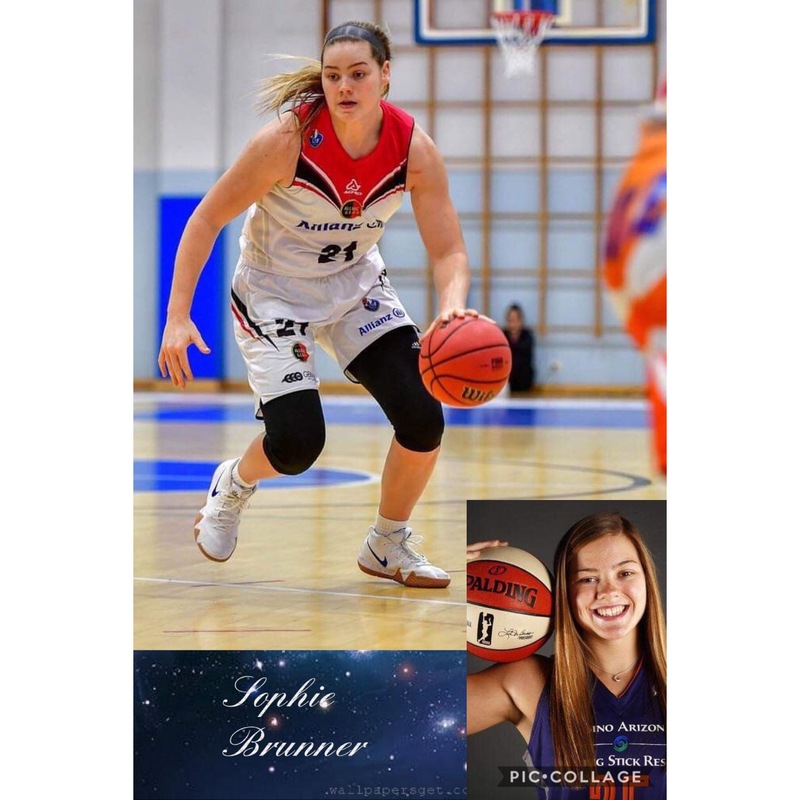 As a graduate Of Freeport Aquin(2 time State Champ), she was a starter in 117 of 128 career games, Brunner was a two-time honorable mention honoree (2016 and 2017) on the WBCA NCAA Division I Coaches’ All-America Team and was the driving force behind ASU’s four consecutive NCAA Tournament appearances (2014-17), which included a berth in the 2015 Sweet 16. Also helped lead ASU to the 2016 Pac-12 regular season championship and a No. 2 seed in the 2016 NCAA Tournament, the highest NCAA placement in program history. • Two-time WBCA All-Region Selection (2016-17). • Joined Emily Westerberg (2004-07) as the only two Sun Devils to be named first-team All-Pac-12 three times (2015-16-17). • Concluded her career 3rd on ASU’s all-time list in career points and field goals, 2nd in rebounds, 8th in field goal percentage, and 9th in free throws. She also finished just outside ASU’s career top 10 for most steals. • Also finished first on ASU’s all-time list for most career rebounds in NCAA Tournament games (70), second in points (112) and field goals (42), third in free throws (27) and fourth in assists (20). • Had 20 career double-doubles (4 in 2014/6 in 2015/5 in 2015-16/5 in 2017). • In addition to earning All-Pac-12 honors three times, also earned Pac-12 Defensive honorable mention notice in 2015 and 2016 and earned Pac-12 All-Freshman honorable mention recognition in 2014. •Earned Pac-12 All-Academic notice three times: honorable mention in 2015-16 and second team in 2017. • Was a two-time nominee for the Allstate WBCA Good Works Team® (2015, 2017). • Earned a silver medal playing for the U.S. Pan American Games Team at the 2015 Pan American Games in Toronto. We have officially become an Under Armour(UA) affiliated program, that will participate in the UA Rise Circuit. With that being said, there are some advantages to being in a program that is affiliated with one of the 3 Shoe Circuits in the Country and that is potential additional exposure to college coaches. For high school girls, we have proven to be the BEST in the area for college recruitment and proud of the amount of athletes that are considered to be top players in the region for their respective high schools. I look forward to your student athlete possibly following in those footsteps. The 9th-11th grade teams will be playing competitive basketball while gaining exposure to college coaches and scouts in NCAA Certified Events. Brianna Lake Wins FNN Performance of Week! Heat Elite Senior Brianna Lake dominated last week in fashion with 23 points against Guilford breaking 1000 points and becoming the girls all time leading scorer for Belvidere North! Bri is currently uncommitted and any college coaches looking for a high academic guard that can do it all from scoring to defending with a high Bball IQ should get in contact ASAP! Great job Bri, all Coaches, Players, Parents, Alumnae, and Fans are proud of you! Heat Alumnae Hits 1000 Points! Shout out to Heat Elite Alumnae Natasha Adames(Class of 2015, Auburn High), Clarke University for scoring her 1000th point today! Natasha has been a force around the rim and brings a defensive toughness against any opponent she faces!!! Great job Natasha and enjoy the rest of your senior season! 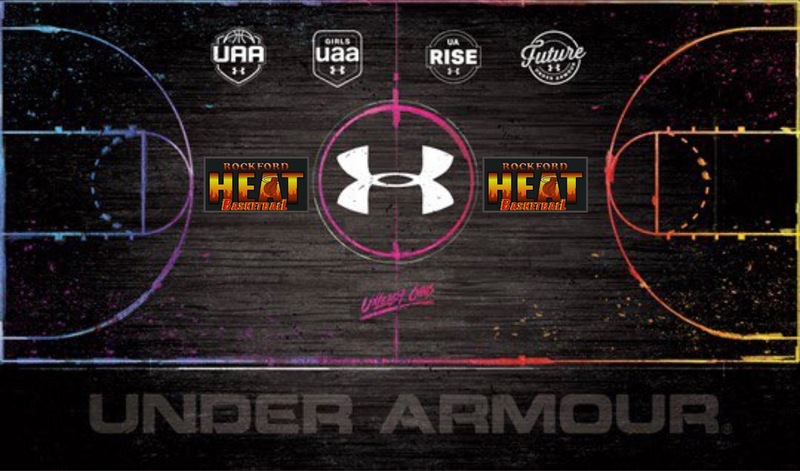 Rockford Heat High School Girls will now be part of the Under Armour Rise Circuit and the Rockford Heat Jr High will be part of the Under Armour Future Circuit starting spring of 2019. We wanted you to be in the loop on some things that have been in the works for a couple years now. With that being said, there are some advantages to being in a program that is affiliated with one of the 3 Shoe Circuits in the Country and that is potential additional exposure to college coaches. There are a total of 3 Shoe circuits that exist. They are UNDER ARMOUR, NIKE, and ADDIDAS. This is NOT to be confused as being sponsored by Under Armour, there are NO programs in the country that are sponsored by Under Armour, NIKE, or Addidas. For high school girls, we have proven to be the BEST in the area and proud of the amount of athletes that are considered to be top players in the region for their respective high schools. I look forward to your student athlete possibly following in those footsteps. 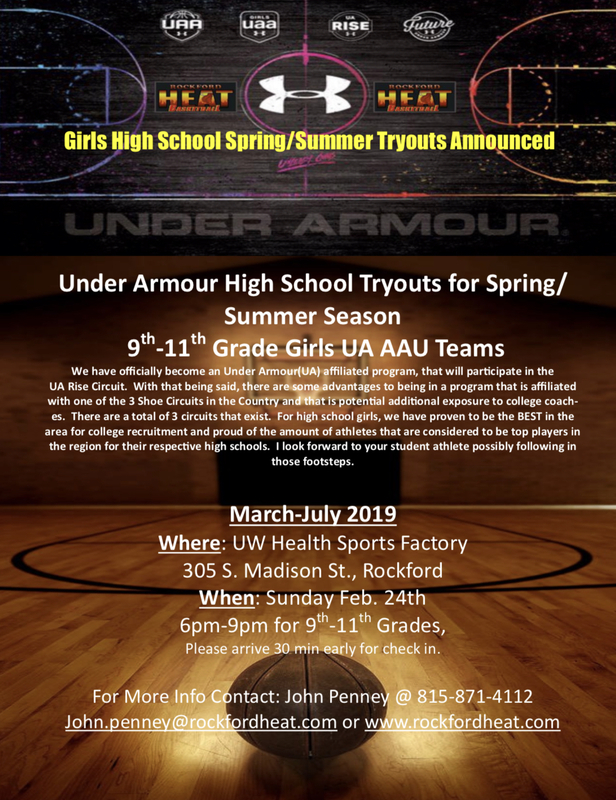 Please click the link below and check out the Alumnae Page for confirmation of why Rockford Heat has lead the way in the area helping Area Athletes connect with college coaches from all around the the country. Tryouts will be announced soon! Speed is our specialty. Our Mission is to help your athlete become their BEST! We want to show you what we are doing to help athletes Be Great Today! This MLK Day, we are hosting a FREE Speed Camp for Athlete’s 13 and Older at 1 pm and 3 pm! If you have been looking for the opportunity to try out our Athletic Performance Training, now is the time!! MONDAY IS FREE, BUT SPACE IS LIMITED, SO PLEASE REGISTER IN ADVANCE! 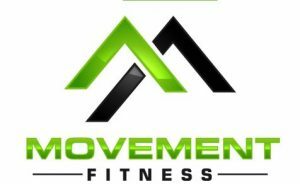 Bring A Friend and Check Out How We Can Help Your Athlete Get Faster, Stronger and Better!!! 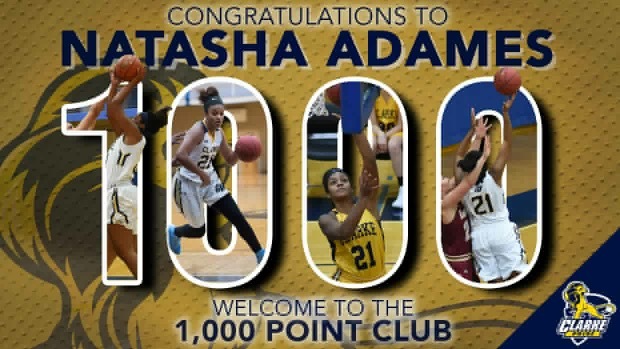 Heat Alum Scores 1000th Point in College! 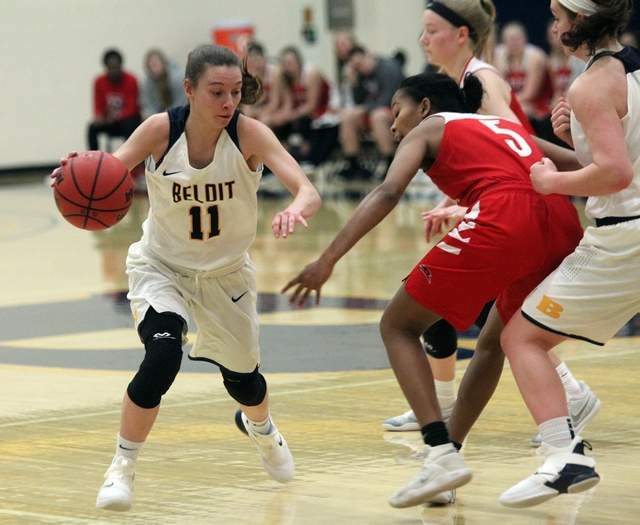 Shout out to Heat Elite Alumnae Shelby Kline(Hononegah High, Class of 2015) for scoring her 1000th point for Beloit College!!!! Great job Shelby, all Rockford Heat Coaches, Players, Parents, Alumnae, and Fans are proud of you. Keep up your hard work and enjoy the rest of your Senior Season!